The apartment is on the first floor of a rural building just renovated. It is accessed by a staircase that leads to a balcony door and 'of 75 square meters with sloping ceilings. and 'composed of large living room with kitchenette and sofa bed, a double bedroom. A bedroom with two single beds and a bathroom with shower and washing machine. with free wifi and satellite television .ampio parking lot below. for gas and electricity and for consumption. the meters are read. final cleaning is 40 euros. the tourist tax 1.00 euros per person per day. sheets you can bring from home or rent at 4 euros per person. towels are to be brought from home. We found the position of the property was perfect, high above the lake with wonderful lake views and away from the crowds. It was also just in the right place on the lake, where we could easily go north or south, or across to the east side by ferry, or go west into the mountains. We had hired a car, so the steep drive up a winding road was no problem. The property itself had everything we wanted, was clean and well equipped with lots of space. Enzo (Vincenzo) was very welcoming and we thoroughly enjoyed our stay and would return. I'm glad you liked it. Thank you so much. I hope to see you soon. Sig JohnThanks to the nice review you are very nice and kind. see you soon next time. Vielen Dank Enzo. Wir haben den Aufenthalt sehr genossen. Etwas in die Jahre gekommene Ferienwohnung mit gepflegter solider Ausstattung und Charme des Hauses. Sehr freundlicher und unkomplizierter Vermieter. Die sehr geräumige Ferienwohnung hat alles, was man braucht für einen schönen Urlaub mit Familie. Die Anfahrt ist beim ersten Mal etwas schwierig zu finden (insb. bei Dunkelheit), aber Enzo, der sehr nette Vermieter, konnte uns sicher zum Ziel führen. Wer es gerne ruhig hat und vom Haus aus direkt in die Natur möchte, dem ist die Ferienwohnung zu empfehlen. Die Wohnung ist gut ausgestattet und kann man aus die Fenster fabelhaft Foto von Gardasee. If you want to have a place to relax - here is it! The apartment has all you need, is clean and spacious. The owner is nice and helpful. The garden is fenced. So children can play without to get lost. The view over the see is wonderful and the curves to get there were not as bad as expected. Really to recommend! grazie gentilissimi per la bella recensione. 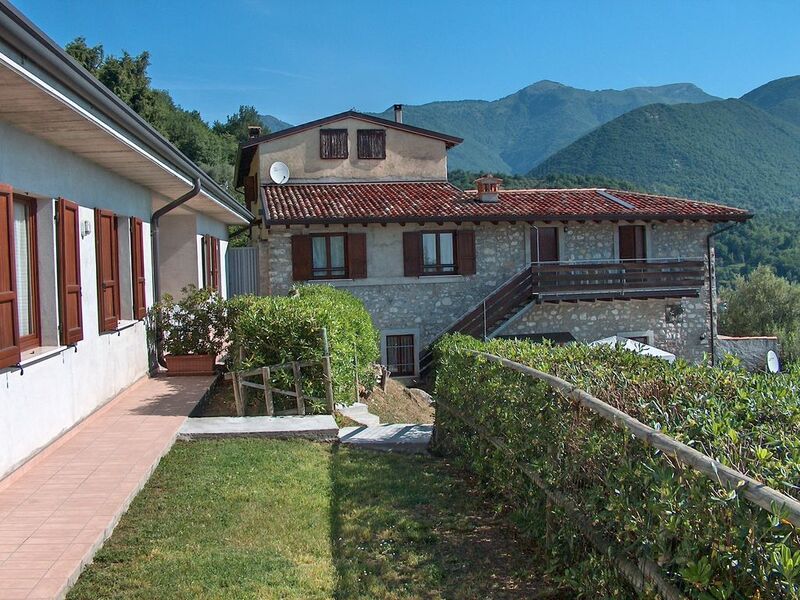 Nestled in an oasis of greenery and tranquility, where you can enjoy a lovely view of Lake Garda, the farm offers the opportunity to spend a pleasant stay in an old country house, partly in stone and whose one side is occupied by the owner. Acconto 30% del prezzo da versare alla prenotazione dell'appartamento. Il riscaldamento ,gas, elettricita' ( su consumo) e pulizia finale ( 30 euro ) non sono inclusi nel prezzo. Le lenzuola easciugamani si possono portare da casa.